Announcing the Gluten Free Progressive Dinner Party. Each month there will be a group of gluten free bloggers that will share great gluten free recipes with you. This will be done in the progressive party format. Every day of the specified week, a different blogger will host and share their recipes. They will direct you to the next blog on the progressive dinner party circuit. 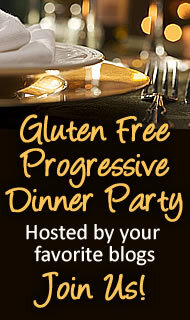 I hope you will join our virtual Gluten Free Progressive Dinner Party by visiting the blogs and sharing your comments. Feel free to share the schedule with everyone too. The more the merrier. Join us for a week long dinner party. Travel from blog to blog and gather up your recipes for an Easter dinner. Monday March 22nd Shirley at gluten free easily will be serving the Appetizer- Deviled Eggs. Tuesday March 23rd Diane at The W.H.O.L.E. Gang will be serving the Salad which is Roasted Red and Yellow Beet Salad with Avocado, Oranges, Red Onion and Toasted Pine Nuts. Wednesday March 24th Katrina at Gluten Free Gidget will be serving the Main Course- Crockpot Leg of Lamb with a Thai Sweet Plum Sauce. Thursday March 25th Shirley at gluten free easily will be serving the side dish Classic Corn Pudding. Friday March 26th Shirley from gluten free easily will be serving Dessert, a Vinegar Pie. February 2010 Gluten Free Progressive OSCAR Dinner Party- Award Winning Appetizers for your Oscar Watch Party! Join us the week of February 22-26th for Award Winning Food for you to make for your Oscar Watching Party or anytime you want rave reviews. Wednesday February 24- Karen from Cook4Seasons is serving Kale Chips and Diane from The WH.O.L.E. Gang using inspiration from Julie and Julia- Easy Gluten and Dairy Free Whipped Cream plus Shirley from gluten free easily shares Southern Fried Oysters. Get ready for your OSCAR party by printing a ballot to share with your guests or for just your family! Also check out this page an Oscar Party Kit. January 2010 Gluten Free Light Winter Warmers Progressive Dinner Party. January 18-22. Welcome to the party. We will be serving those foods that warm you up, but that are not as heavy on the calories. Great things to be eating as you start off the new year. Now if you live where it’s always warm, don’t rub it in and just play along. Here is our schedule so far, but remember to check back and see what was added. Monday January 18th Karen from Cook4Seasons made Creamy Potato Leek Soup and Roasted Cauliflower Soup with Gluten Free Croutons by Alison from Sure Foods Living. Tuesday January 19th – Winter Fire Roasted Tomato Soup w/ Prosciutto Topping from Diane- The W.H.O.L.E. Gang. Wednesday January 20th –Mexican Seafood Soup from Diane- The W.H.O.L.E. Gang and SeaMaiden from Book of Yum with a Vegan Un-Chicken Roasted Vegetable Soup. Thursday January 21st – Amy from Simply Sugar and Gluten Free served Black Bean Chili with Butternut Squash & Swiss Chard and Shirley from gluten free easily shared Wassail. Friday January 22nd -Ali from The Whole Life Nutrition Kitchen served Moroccan Chickpea and Potato Soup. I will add in the list of blogs as soon as we finalize the menu. Check back and then join us as we keep warm without tons of calories! Here is the December Schedule for our Gluten Free Dessert Progressive Dinner Party! Monday December 7th Baked Desserts with Shauna- gluten free girl and the chef made Gluten Free Cinnamon Rolls, Alison- Sure Foods Living made Grandma Anne’s Butterhorns, and Ali- The Whole Life Nutrition Kitchen made Soft Molasses Cookies. Tuesday December 8th Frozen or Chilled Desserts with Shirley- gfe gluten free easily made Honey Cinnamon Grand Marnier Ice Cream and me The W.H.O.L.E. Gang made Chocolate Sorbet with Roasted Chocolate Nibs. Wednesday December 9th Chocolate Desserts with Karen- Cook4Seasons made Raw Goji Berry Truffles and Ali- The Whole Life Nutrition Kitchen made Milk Chocolate Cupcakes with Chocolate Frosting. Thursday December 10th No-Bake Desserts with me, The W.H.O.L.E. Gang, I made Cranberry Chocolate Nut Truffles. Friday December 11th Favorite Desserts with Melissa- Gluten Free For Good made Babycakes Brownies and Jean- Gluten Free Organics made Ready in a Week Fruitcake. November was our first month and we chose Thanksgiving as our theme. December’s theme is Desserts. Please join us December 7-11th for a Gluten Free Dessert Progressive Dinner Party. Schedule to be added so check back soon!